being MVP: Ah Goo Baby: Kneekers & Giveaway! Ah Goo Baby: Kneekers & Giveaway! Guess who is trying to crawl? He's a bit late compared to others his age - darn FB friend updates - but to each their own right? Mason received some Kneekers for review from Ah Goo Baby. 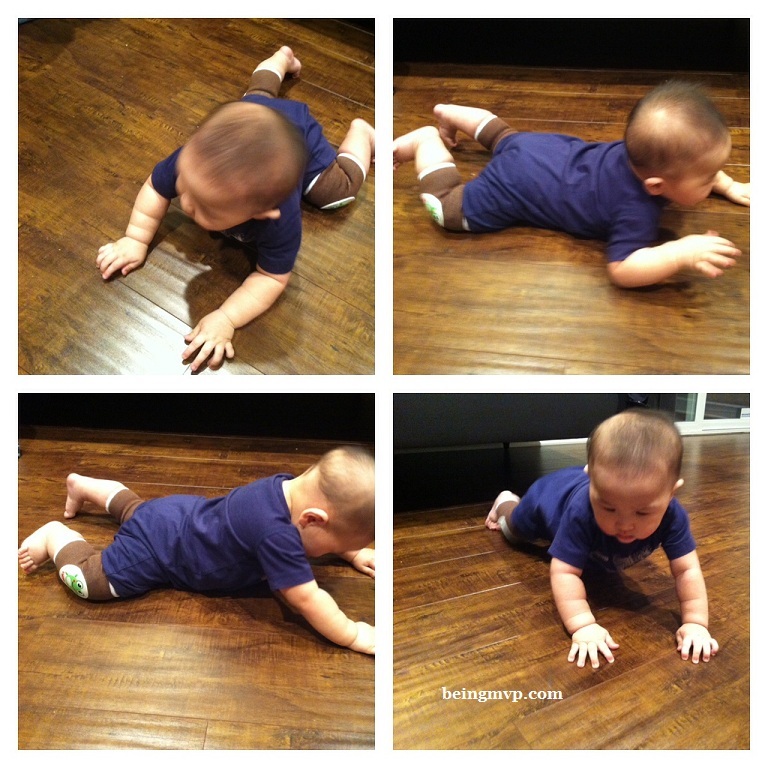 I usually have Mason in pant or leg warmers when he practices crawling. Otherwise, I place him on the playmat. Why? Because I don't want him to get rug burn or wear his knees out on the wood and tile floor. The Kneekers are the perfect solution because he's going to be mobile quite soon and our entire house is wood/tile - I can't "cage" him all the time. The Hoppy Frog Lean Leg in Toffee Kneeker slipped right over Mason's cankles and fit over his knee. It's similar to Hubs' knee brace but with a sort of plastic/vinyl shell at the knee for extra protection against hard surfaces. Mason was apprehensive at first and inspected his knees. Within seconds he flipped over and did some inchworm moves. It's hilarious watching him turning in circles and flopping around. He's so determined and I know he will soon be quick so I need to cherish these last moments while they last. When these get dirty, I can pop them into the machine for wash and dry! The Kneekers come in various designs that are fun and quirky. You can opt for lean or chunkalicious leg. Mason is meaty, but since he is starting to loose some of his rolls, I went with the lean leg and they are a bit snug. I should have gone with the chunkalicious. Buy It: You can purchase Kneekers for $14.95. One Winner will Receive a Pair of Kneekers! I like everything. The bottle strap would be so nice to have and the Grab & Go bag is quite awesome. I like the ark changing pad. i like the ark diaper changing memory foam pad! I like "the bib "
i like the grab and go bag! I like the Diaper Pouch! I also like the Bib/Burp Cloth. i love the grab and go bag! What a cool product. I need some kneekers for my 8 month old son! I also like the wipes case and the diaper pouch. So many cute and practical things, but I think my favorite is the plush pad. I like the Grab & Go Bag in blush. I love the grab n go bag. In addition to the kneekers, I like the stroller clip. I like The Plush Pad. I like the Grab and Go bag. i like the Kneekers in Monster or grab and go bag. I like the grab n go bag!